Russia's refusal to allow qualified Ukrainian doctors to visit Nadiya Savchenko indicates an attempt to conceal her real health condition. The Ukrainian Foreign Ministry has expressed strong protest with regard to the continuation of the illegal detention by the Russian authorities of illegally sentenced citizen of Ukraine – Nadiya Savchenko, which led to significant deterioration of her health and constitutes a danger to her life. 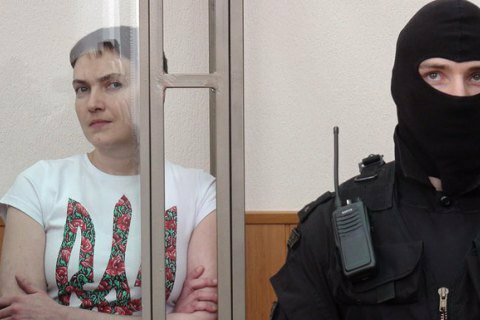 It reiterated that under the existing prolongation of the detention of illegally sentenced Nadiya Savchenko, the Russian side bears full responsibility for her health and life. The Ukrainian Foreign Ministry urged Russia to immediately allow Ukrainian doctors to visit Nadiya Savchenko and to release her without delay, as stipulated by the Minsk agreements, which the Russian Federation is a signatory to. "We call on the entire international community to continue its pressure on the Russian Federation with the aim of saving life of the illegally sentenced citizen of Ukraine Nadiya Savchenko and her return back to Ukraine," it said.